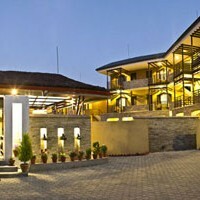 Lakeside Resort is just 10 minutes walk from Pokhara’s busy tourist center and a 10 minute ride from the airport. Their property provides the perfect environment for relaxation, nestled among several acres of private garden just outside the Lakeside bustle. Their luxurious guest rooms and suites overlook their garden and feature spacious terraces, ultra-modern interiors and plush accommodations.